When I arrived on Friday to start my long weekend construction job... 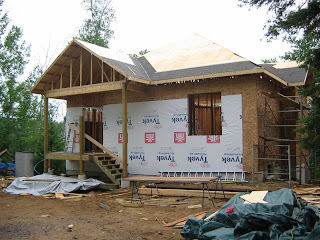 I was hoping to see a finished roof -- however rain, a massive amount of rain has conspired to slow progress. Everyday during the week it rained, consequently my roofing contractor was not able to complete the work. The roofing contractor quoted that it would take four days to complete, but with rain every day he was barely able to get a days work in. It may look like the roof is at least sheathed, however, what you are seeing is only the front half of the roof which is exactly and only the area he was able to sheath. The black stuff you see at the lower portion of the roof and up the valleys - that is the part of the roof where the slopes of two roof elements meet - is called ice and water shield. Ice and water shield is used to protect the roof from the ice damming effect that can occur in the winter which lifts shingles and allows melted ice and snow to enter your house. Hopefully, the weather will cooperate this week!